In addition to a fierce attitude, the wolverine's physical attributes, like huge paws and thick, water-repellant fur, are well-suited for living in harsh, snow-capped mountains. Characteristics like these are what allow wolverines to survive sub-zero temperatures while scaling 1,500-foot vertical climbs across ridgelines with daunting names like the Iceberg Notch. But tragically, the wolverine's very symbiosis and interdependence with its natural surroundings is also what makes it a modern-day canary in the coal mine for the impacts of climate change. "We think about the polar bear when we think about the poster child for climate change, and that's appropriate, but the wolverine is unfortunately in the same boat," says Preso. "They're really dependent on areas that have maintained snow pack into the spring period and increasingly in the Rocky Mountains, that's a dwindling landscape." "I've seen just without pulling out photographs or maps each year the changes that occur [in Glacier]. Now when we go up to monitor the size of the glacier … we walk across rocks and land that has not been exposed to the atmosphere for probably 500 years," says Fagre. "So, in a sense, we're kind of the first people to walk on that in many hundreds of years since it was covered by ice." But it's not just glaciers that are disappearing. Hemlock and cedar forests widespread across the Crown are giving way to lodgepole pine, an evergreen tree that acts as a giant matchstick to the area's increasingly dry landscape. And like the wolverine, the American pika, a small mountain-dwelling mammal that's extremely sensitive to high temperatures, is also quickly running out of suitable habitat as warmer temperatures chase them higher upslope to cooler climates. "These are sentinel species," says Gary Tabor, director of the Center for Large Landscape Conservation and a member of the Roundtable on the Crown of the Continent . "If you're not paying attention to what's happening in the world of the pika, then you're not really paying attention to the indicators that affect people's livelihoods." Indeed, though not every species will be negatively impacted by climate change, one that is sure to take notice of a hotter planet is humans. Every year, Glacier National Park alone draws two million visitors who contribute $150 million to the local economy, a huge economic benefit for the area. In addition, the Crown is also a tremendously important landscape for native American tribes that reside there, such as the Blackfeet Indian tribe, which considers the park and many of the surrounding landscapes as sacred areas. Ranchers and fishermen also depend on the area's resources, like clean air and water, for their livelihoods. Scientists can't yet draw a picture of how the Crown will look after warmer temperatures have taken their toll, but the image that's slowly taking shape is one of humanity's last remnants of untouched wilderness being irrevocably altered. "It's sort of like an immune system. You can handle a certain amount of germs on a daily basis, but once you get run down, all of a sudden you get sick because your immune system has dropped," says Fagre of the USGS. "Well, in a parallel way, that's what seems to be happening for many parts of the West, at least where something like air pollution and landscape fragmentation doesn't have a big effect, but then something like climate change can be the one that puts it over the top. That's basically a tipping point." Fortunately, the Crown hasn't "tipped" yet, thanks to the region's large, intact and undeveloped landscape, which makes it better positioned than other areas to withstand climate change's blows and adapt to such changes. Although warmer temperatures will undoubtedly place entirely new stresses on the Crown ecosystem, the landscape allows wildlife species to move across large areas and shift their ranges as vegetation changes due to warmer conditions. To date, the Crown's wide array of microclimates has helped it hedge its bets against ecological disturbances. But this vast ecosystem, created about 10,000 years ago by the last Ice Age, can only take so much human disturbance, which is why conservation groups like Earthjustice are working to preserve the natural legacy of the Crown and give it a fighting chance in withstanding the impacts of climate change. Beating back development proposals and inappropriate uses of the area provides the broadest possible landscape for the wildlife and other resources of the Crown to deal with the changes that are now taking place. "In order to protect a place like the Crown of the Continent, there's not just one case you bring to accomplish that goal," says Preso of Earthjustice. "It requires a lot of work in a number of different places and often smaller scale battles that add up to a long-term protection for this irreplaceable landscape." 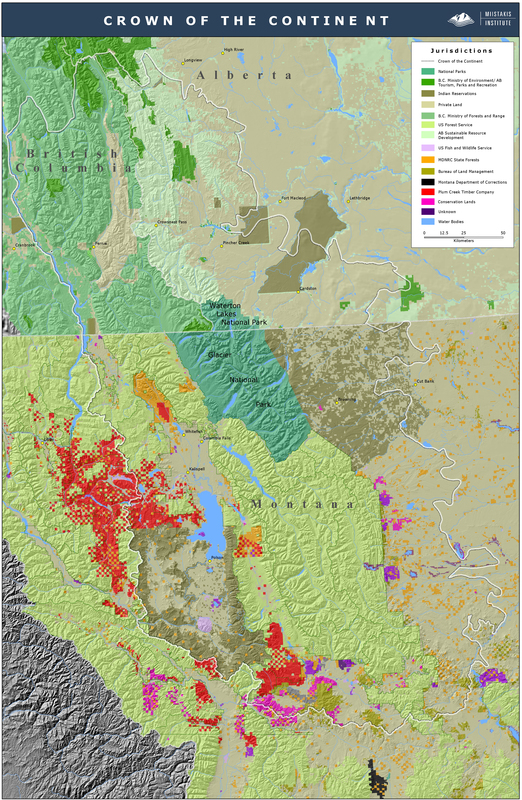 A combination of U.S. Forest Service lands, national parks, tribal territories and private property, the Crown of the Continent links western Montana with southern Canada, encompassing some of the largest blocks of wilderness in the contiguous United States. Though there have been many successes in preserving this ecosystem in years past, including a ban on oil and gas leasing in the Rocky Mountain Front, the Crown remains a living artifact of glacial activity, and as a result is particularly vulnerable to the changes wrought by warming climate. 1. 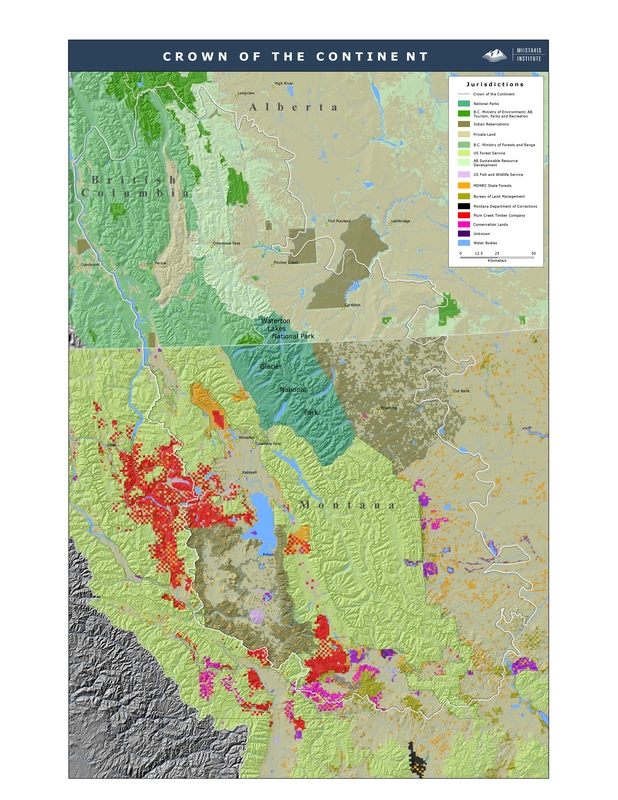 The Crown is a 10-million-acre international region in western Montana and southern Alberta that encompasses some of the largest blocks of wild lands in the contiguous United States. 2. In the early 1890s, conservationist and Glacier Park advocate George Bird Grinnell coined the term "Crown of the Continent" to highlight the region's geographical importance as the headwaters of the continent. 3. The Crown of the Continent, which is approximately three times the size of Connecticut, is considered one of the last wild places remaining in the lower-48 states. 4. Every species that Lewis and Clark encountered on their expedition through the Crown in the early 1800s still exists today, with the exception of bison. 5. The Crown has a remarkable assemblage of high peaks, aspen glades, native grasslands and clear-flowing rivers that draws in thousands of visitors from around the globe. 6. The Crown serves as an essential home range for wildlife by connecting vital habitats for a wide range of species, including grizzly bears, moose, wolverines, wolves and lynx. 7. More than 200 species of birds exist in the Crown, including hawks, eagles, owls and falcons. 8. About one-third of the Crown ecosystem is protected in its natural state. 9. Native Americans such as the Blackfeet Indian Nation continue to occupy part of the Crown, which has been their home for thousands of years. Their Creation Story, handed down through a hundred generations, takes place at Badger-Two Medicine. 10. The Rocky Mountain Front, part of the Crown ecosystem, stretches for more than 150 linear miles in Montana.